Use your company’s website to answer questions and field applications. If you’re still asking applicants to fax in their application or send it via snail mail, don’t be surprised when a large number of highly qualified people opt not to submit their materials to you. Hiring today is all about convenience, and you need to make sure that you’re keeping the process as low lift as possible. You should accept applications via e-mail, and should consider having a portal on your site where interested people can submit their materials. 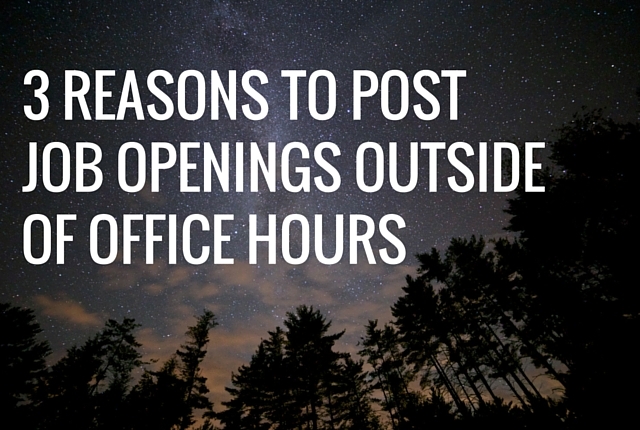 Realize that most people are looking for work outside of office hours. The kind of employee you want coming to work for you isn’t the one who’s blatantly browsing for other jobs while they’re on the clock at their current position. Because of this, it’s likely that your new hire will be searching for open positions at night and on the weekends. If you’re only talking about your open jobs from 9-5 Monday through Friday, it’s likely that they’ll miss your message. Instead, make it a point to advertise job openings on LinkedIn, Twitter, Facebook, Instagram, and other social media platforms during the hours when a job searcher would be on the hunt. If you don’t want to force one of your current employees to man the accounts during these times, you can set these updates to publish automatically. Get out and meet people face to face. Reading a job posting online is enough to encourage some people to apply, but for others it takes a little bit more. Job postings can be boring and flat, so passive candidates might not find that they’re inspiring enough to prompt them to submit a resume. If you truly want to spread the word about your opening, it’s important to get out in your community and meet people. Current employees are powerful brand ambassadors for a business. Talking about why you love your job and why your company is a great place to work is typically a far more effective recruitment tool than any job posting could be. How do you take a proactive approach to recruiting new employees? Share your thoughts with us in the comments!